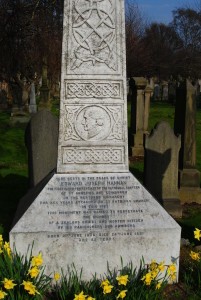 Canon Edward Joseph Hannan is known for his involvement in the founding of Hibernian Football Club, ‘Hibs’. In the early 19th century many Irish people migrated to Edinburgh, living around the Cowgate, Grassmarket, West Bow, Pleasance, Holyrood, St John’s, West Port, Candlemaker’s Row, Potterrow, Lawnmarket and Canongate. This area, centred on the Cowgate, became known as ‘Little Ireland’. It was an area of desperate deprivation, containing one of the worst slums in Europe. The Irish immigrants did not mix with the local people. The Catholic Church, concerned about their welfare, raised £4000 with the Irish community to purchase the Episcopal Church in South Grays Close. The church was inaugurated as St Patrick’s Catholic Church on 3rd August 1856. Father Edward Hannan was appointed as a curate to St Patrick’s in October 1861. He was appointed Priest in charge at St. Patrick’s in 1867. One of his first acts was to set up a branch of the Catholic Young Men’s Society (CYMS), which had been inaugurated in Ireland a few years earlier, with the aim of uplifting young men through prayer, religious practice, education and social activities. The people of Edinburgh were largely ignorant of, or hostile to, the Irish community in their midst. 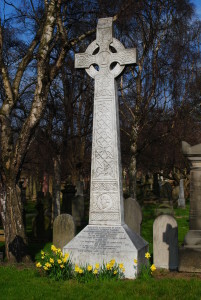 Father Hannan wanted the people of Little Ireland to integrate with the general community of Edinburgh, as this was their only hope of future prosperity. However he had no idea how to go about this. One of his parishioners, Michael Whelahan, had become interested in the game of football, but anti-Irish prejudices made it almost impossible for him or his friends to play for any of the established clubs. Michael took the idea that the CYMS should themselves form a football club to Father Hannan. Thus the Hibernian Football Club was born on 6th August 1875, with Father Hannan as its first manager. The next task was to obtain official recognition by the football authorities. The Edinburgh Football Association was not sympathetic, issuing instructions to all member clubs that they s hould not play matches against the new club. However, intense lobbying with other clubs put pressure on the authorities, and Hibs played their first game in the Scottish Cup against Heart of Midlothian in September 1877. Edward Joseph Hannan was born in Ballingarry, County Limerick, Ireland on the 21st June 1836, and was ordained as a priest on the 13th May 1860. While on holiday in Scotland, he met Bishop Gillis who was responsible for the Church in the East of Scotland. The Bishop described the problems of Little Ireland, and Hannan agreed to move to Edinburgh. He served for 30 years at St Patrick’s, and died of pneumonia on the 24th June 1891, at the age of 55. 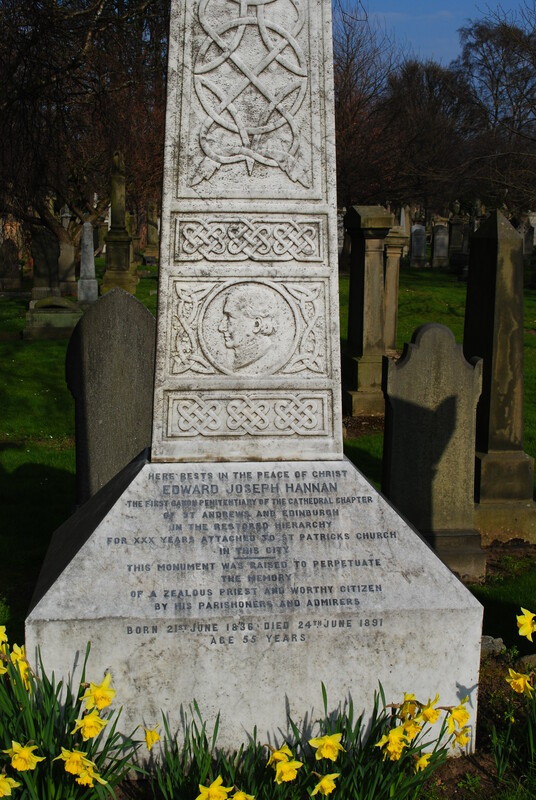 His monument in Grange Cemetery was funded by public subscription. My grandfather was from limerick. His name was hannan. He came to oldham Lancashire and had 6 children.my uncle was joseph.I wonder how I can find out if canon Edward was related?